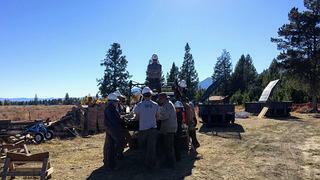 Corpsmembers work on repairs at Bar BC Dude Ranch at Grand Teton. Projects included constructing a giant gate while improving wayfinding at the site's entrance. The project was intensive but rewarding for the crew. In fall 2018 at Grand Teton National Park near Moose, Wyoming, the Rocky Mountain Youth Corps (RMYC) completed a range of projects around the Bar BC Dude Ranch site through HOPE Crew (Hands-On Preservation Experience). After shifting from the original one-track plan of roofing the ranch's Corse Cabin, the team repaired a historic horse corral, patched the rutted ranch road, and constructed a large gate while improving wayfinding at the site's entrance. 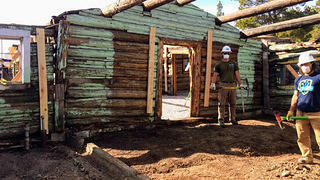 Corpsmembers also graded the ground on the Bar BC main cabin, designed and built multiple lumber racks, and cracked an incredible amount of puns. 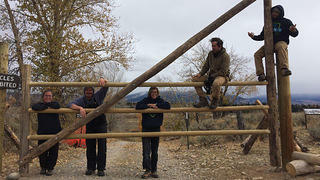 This versatile, energetic crew made some vital changes to one of Grand Teton's biggest work sites.